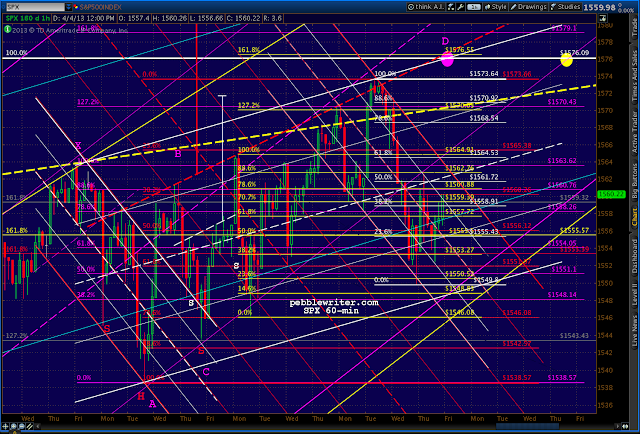 I’m inclined to stay short for the purple channel bottom at 1546.08 or the 1.618 at 1549.09, with stops at 1558.47ish. But, anyone who doesn’t mind the extra trading might consider going long here — with the understanding we might run into trouble at the channel top (small falling white) at 1558 or so. But, if the downside momentum builds, 1542.57 is definitely in reach. I'll play the downside on the opening, but be ready to bail at those levels. A drop through 1538 opens up much lower prices and essentially busts the channel that dates all the way back to November's 1343. 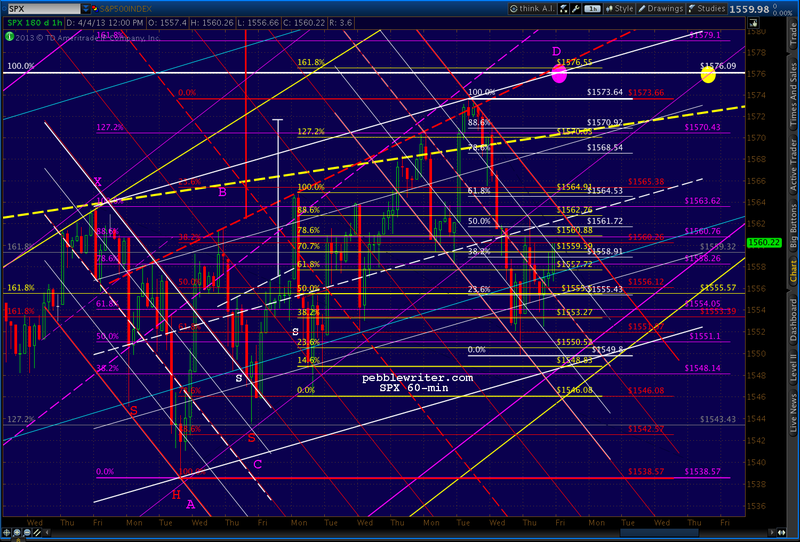 So I'll take a stab here at 1539.86. Going long again with stops at 1538. Note that at these prices, SPX has completed a Head & Shoulders pattern, albeit with a very steep slope. But, it's not verified unless we close below 1545 or so. Even then, we've had two such (normally very reliable) bust in the past several weeks. If drops like this morning's make you nervous, the market makers have done their jobs. Remember, this morning's plunge is by design. The open interest on the SPY 155 weekly calls that expire today, for instance, is 97,000 contracts. Each contract gives you the right to buy 100 shares of SPY at 155 through today. It's the equivalent of SPX 1550. They're currently trading at 12 cents (probably a good deal.) But, three days ago -- when SPX nudged into the 1570's -- market makers would have been happy to sell you all you wanted at 2.33. A $23,300 "investment" in 100 contracts at the high would be worth $1,200 -- a 95% loss in 3 days. This is an example of the typical game played by market makers who just love optimists. They love pessimists, too, and just sold a boat load of puts this morning to those expecting this morning's plunge to keep going to 1500. It's taken me a couple of years to come to the conclusion: if you can get the kind of results we do without leverage and without options, why take the risk? 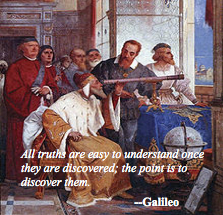 It's hard enough to be right on the direction and magnitude of a move, without having to be right on timing too. Even if we had held long instead of shorting at 1573 on Tuesday, we'd be down a whopping 1.7%. Beats the heck out of -95%. By shorting, we actually made money. I met an old friend for coffee yesterday, and we talked about pebblewriter.com and my investment strategy. He asked if the results we got this past year weren't simply attributable to a great market. The question took me by surprise. The S&P 500 was up 8.75% between Mar 22, 2012 (our inception) and Feb 28, 2013 (without dividends.) That includes a 12.8% gain from Nov 16 - Feb 28. I guess the MSM has done a bang-up job of selling this as a "great market." But, the question did get me to thinking. As of Feb 28, just shy of a year since inception, we were up about 113% in a theoretical portfolio where we bought SPX at called bottoms and shorted at called tops. Forty-eight percent of our gains came from long positions and 52% from short positions. In other words, we benefited slightly more from declines than from rallies. Unlike almost all long-short funds, we did it by being either long or short, depending on my outlook. So, anyone who captured all of those major moves earned about 49% -- much better than the buy-and-hold approach of 8.75%. They would have had short-term rather than long-term capital gains; but, anyone with a marginal tax rate below 85% wouldn't have minded. My objective is simply to capture most of the moves most of the time. If 49% represents the most we might have earned by capturing all the major moves all of the time, we apparently earned about 64% by playing interim moves -- going long and short. Shorting the market scares some people. When I was a shiny new broker back in the Middle Ages, all they had to say was "when shorting, you have unlimited losses." It sure scared me -- which was the point. But, by using stops this past year, we limited our single biggest losing trade to 1.5%. There's always the possibility of a 10% gap down, but by using e-minis rather than cash markets and going to cash in precarious situations, that risk can be greatly reduced. What I find really risky is buy-and-hold investing, where investors hold long through 10-20% declines. If your name's Buffett, no big. But, if you need money for a wedding/college education/vacation house in a few months, and that 10% decline turns into 58% (2007-2009), 51% (2000-2003) or even 22% (May-Nov 2011)? Everyone's talking about whether the S&P 500 will make a new all-time high, topping 2007's 1576.09. But, after inflation, it's still down about 25% from its 2000 peak. The real Nasdaq is down over 50%. For someone planning to retire, that's risk. One final thought...the beauty of our strategy is it provides concrete decision points. If you buy AAPL at 500 based on the hype around the new iWatch and the stock falls the following day to 490, should you hold? What if it falls to 460? What if the iWatch is released and the stock only recovers to 485? Do you sell? Double down? Wait for the sales numbers? Wait for the next quarterly report? At what point do you pull the plug? Between Harmonics and chart patterns, we're rarely left without a sense of whether our investment thesis is correct or not. Even a simple channel will usually tell you if you're on the right track. In early December 2012, we had been following an analog that had earned us over 10% per month -- forecasting all the major moves since the previous March. The analog called for a reversal and move lower from either at 1424 or 1446. I tried shorting both times, giving up a few points before it became apparent the market wasn't going to tumble. The same thing happened a few weeks later, when the Fiscal Cliff "solution" sent the market gapping higher after New Years Day. I will continue refining the strategy and trading techniques in anticipation of our new fund that I anticipate coming out next month. I have developed a distribution list for those who have expressed interest in getting more info. If you'd like to be on it but haven't yet contacted me, please CLICK HERE. The market has rebounded nicely since this morning's 1539.50 low. Anyone too wigged out about Cyprus, the NFP number, Korea, etc. should take the money and run. Forget about the market and enjoy your weekend. But, 60-min RSI just broke out of the most severe of the bearish channels and SPX should have no trouble reaching 1560 either today or Monday. What it does then matters a lot, but I suspect our forecast is still intact. I'll hold long unless we reach 1560 today, at which point I'd probably go to cash. Stay tuned. Nice safe close, back in the loving arms of both the purple channel and the white channel. I'll update the forecast later this afternoon, but I believe we're in good shape re the forecast.